The number of visitor arrivals to Macau during January fell by 4.7 percent year-on-year according to data released on Monday by the city’s Statistics and Census Service. The bureau said the decline was because of the “timing of the Chinese New Year” which fell in February this year, compared to January in 2017. The holiday is calculated based on a lunar calendar and the dates vary from year to year. The monthly tally was approximately 2.47 million, compared to nearly 2.88 million in January 2017. The number of same-day visitors decreased by 16.8 percent year-on-year to just below 1.26 million, while the number of overnight visitors rose by 8.8 percent to just over 1.48 million. In January, the average length of stay of visitors was 1.3 days, up by 0.2 of a day, judged year-on-year. During the January reporting period, the total of visitors from mainland China decreased by 3.5 percent year-on-year to approximately 1.93 million. 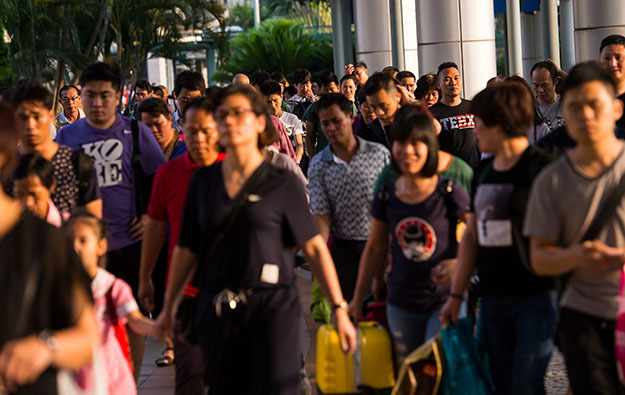 The monthly number of mainlanders travelling under China’s Individual Visit Scheme – accounting for 896,088 arrivals in January 2018 – fell by 20.6 percent year-on-year. Overnight visitors to Macau are a segment generally regarded as of higher value to the local casino industry than day-trippers. But a number of investment analysts have said that Macau’s headline visitor numbers historically are not directly correlated to overall gaming demand, as gross gaming revenue in the Macau market has been typically skewed to high-end play. Casino gross gaming revenue (GGR) in Macau rose by 36.4 percent year-on-year in January to MOP26.26 billion (US$3.26 billion), according to official data. In a Monday note, brokerage Morgan Stanley Asia Ltd noted that the increase in casino GGR last month – which occurred despite a decline in aggregate visitor arrivals to Macau during the period – suggested a “higher spending per capita”. The brokerage highlighted some factors that – according to its estimates – contributed to drive casino mass-market revenue up 29 percent year-on-year in January. “Macau saw much higher overnight visitors, more air passengers, and many more visitors from lower-tier cities,” said analysts Praveen Choudhary and Jeremy An. According to Morgan Stanley, the number of visitors to Macau from lower-tier cities in the mainland grew by 17.6 percent year-on-year. The brokerage suggested in a report last month that Macau casino market was likely to benefit in coming years from China’s lower-tier cities becoming wealthier and their citizens becoming more eager to travel and engage in discretionary consumer spending.